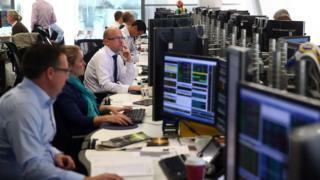 Share prices in London fell on Monday and the FTSE 100 index closed 41 points lower to 6,799, a drop of 0.6%. The biggest fallers were Next, down 2.7%; Royal Bank of Scotland, down 2.6%; and BT Group, down 2.4%. One issue concerning UK investors is the result of the forthcoming bank stress tests, which will be published by the Bank of England on Wednesday. In the FTSE 250, shares in Capital & Counties jumped 8% after an upbeat trading statement. Elsewhere in Europe shares fell, dragged down by bank shares. Investors continue to worry that the troubled Italian bank Monte dei Paschi may fail to raise €5bn required to bolster its finances. On the currency markets, the pound fell 0.6% against the dollar to $1.24, and dropped 0.4% against the euro to €1.17.